This page is meant as a small introduction of me and the ‘birth’ of this site. My name is Esther and I’m working as a Technical Consultant specialized in Virtualization solutions. In 1997, I finished my Master of Science in Computer Science and was ready to conquer the IT consultancy world. As I studied at the only dutch University with a student dorm on campus, I was spoiled (we’re talking 1997!) with a 10 MB network connection in my room. I got the early preview at the interconnectivity these new technologies in the digital world were offering. I had a blast discovering the internet. Learning about new cultures and sharing ideas with people all over the world through IRC. I really enjoyed this new community idea. Even jumped on a plane, flew halfway across the world and attended my first IRC meeting. Discovering the faces behind the nicks. After I finished my Master I started out as a web developer, turning a hobby into a job. As I have this habit of always looking at the impact of my work on the complete infrastructure I soon learned about database administration, server administration and networks, thus expanding my knowledge in all directions and creating a broad knowledge base of IT technologies. With this broad knowledge base, my jobs as an IT consultant changed from web developer, database administrator, server administrator towards the SBC solutions which (to me) offered this great platform for different IT components. I needed to combine my knowledge of Servers, Applications, Databases, User Profiles and Desktop environments to create and manage new Workspaces. And with the latest Virtualization developments, my options to create new User Workspaces are becoming even more fun. As I’m discovering the latest techniques in the world of Virtualization, I felt the urge to share my adventures and built my own online knowledge-base. Hench I decided, as many did before me, to create a website to blog and share the knowledge. Creating a website, meant I needed to register a domainname. So I wanted a name that would be easily linked back to me. It most definately would have to hold (a part) of my own name (Esther) and could be linked to the Virtualization Technologies (virtual). Of course this still left tons of options and combinations. I’m very honored to be a Citrix Technology Specialist (CTP) awardee for 2015, 2016, 2017 and 2018 and to be part of a great group of guys and girls with a passion for sharing Citrix and IT knowledge with the community! 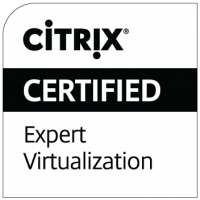 Citrix Certified Administrator for Citrix XenServer 6. Citrix Certified Administrator for Citrix XenDesktop 5. Citrix Certified Administrator for Citrix XenApp 6. Citrix Certified Administrator for Citrix Password Manager 4. Citrix Certified Sales Professional 2012. RCP – RES Software Certified Professional. RWMCP 2012 – RES Workspace Manager 2012 Certified Professional. RAMCP 2014 – RES Automation Manager 2014 Certified Professional. RITSCP 2014 – RES IT Store 2014 Certified Professional. In january 2011 I was rewarded with a Logica Gold Award (Employee Value Proposition “Committed”) for my work ethics, motivation and commitment.